Sure, every single restaurant in the fast casual American genre has a spinach dip and honestly, they’re not that good. There was something about the Houston’s version that was really great – creamy and perfectly cheesy – and all others pale in comparison. Copycat recipes abound online and I’ve attempted most of them. All wrong. I’ve read insider secrets from alleged former employees and made those recipes too … nope. Getting that creamy/cheesy balance just right is surprisingly difficult. Every couple years I’ll give it a shot and every couple years I’ll shelve the file out of frustration. 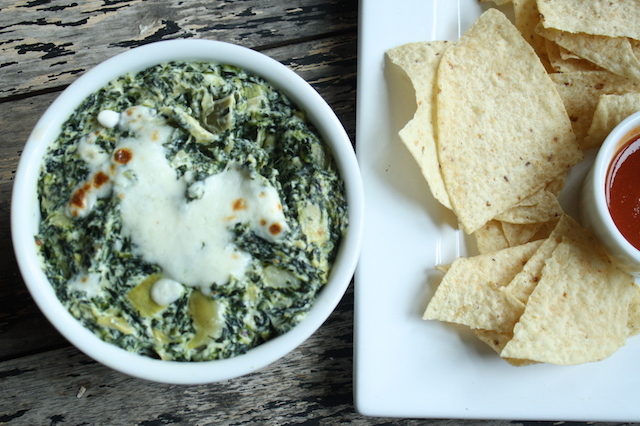 But lately … damn if I’ve been craving that spinach artichoke dip. So I pulled out all my notes and failed attempts, dusted off those old, withering memories and took another crack at it. Must be all the stress eating I’ve been doing in the last two weeks that has me craving hot cheesy, creamy foods: pot pies, spaghetti & meatballs, mac and cheese and yes, several versions of spinach artichoke dip. I scrapped all my previous recipes and started from scratch, building a base of cream cheese and sour cream, parmesan and mozzarella for that right mix of creaminess and cheesiness. For the vegetables, I used boxes of defrosted spinach and artichokes because they’re readily available and work perfectly. Why bother with fresh if they’re going to be slathered in dairy and won’t make a bit of difference anyway? A little garlic, a little lemon juice for acidity and a pinch of pepper flakes, this was looking promising. Cooked on the stovetop until hot, I piled it into an oven safe dish and broiled a few minutes with a bit of extra cheese until nice and bubbly. Then I served it with the traditional tortilla chips and little dishes of sour cream and salsa alongside. I have always thought this was a tad strange, dips alongside a dip, but damn it works. I don’t know why more dairy on a dairy rich dip is needed but it works. Don’t question such things. Is it like the original? I think so. Maybe? It is pretty dang dairy heavy – cream cheese, sour cream, parmesan and mozzarella, oh my! – but think of it as a calcium builder. If anything, I think the dairy could be doubled as my version may be bit heavier on the spinach/artichoke than I remember. Oh my! Regardless of its authenticity, it’s pretty good and will be a great thing to add to your holiday line up. Truth be told I’m working off a hazy 15 year (at least) memory though I see there is one location in Scottsdale so if I can squeeze it into the holiday madness this year when I’m back in Arizona, maybe I’ll swing over and refresh my memory. Stand by – there may be an update. And maybe, with all these years of cooking experience in my pocket, I’ll figure out those chicken tenders too because I’ll be damned if I can figure out how they they make those wispy, crispy tempura-like tenders so good. 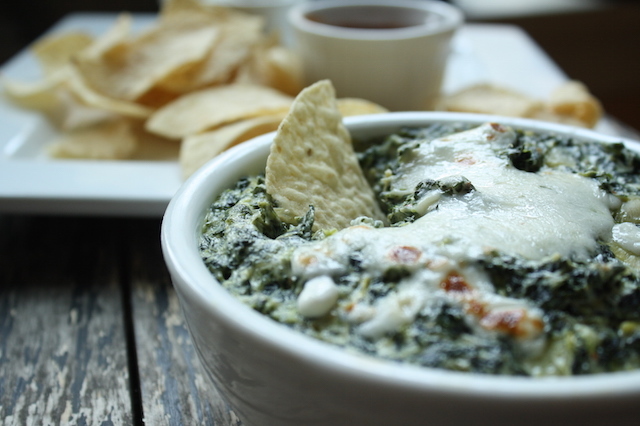 STRESS THERAPY BAKING FACTOR: SLATHER ME IN SPINACH DIP. Gawd I love this stuff. 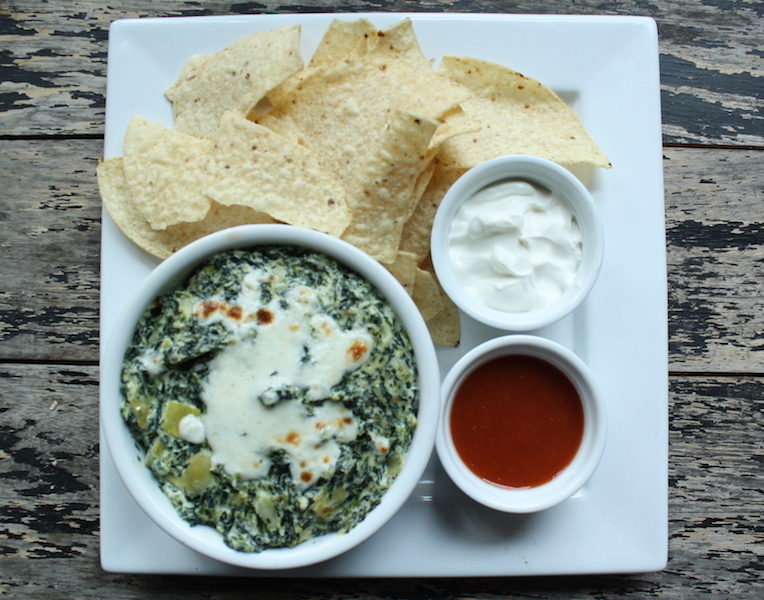 The combination of creamy spinach on a crunchy tortilla chip dipped in more sour cream and a dash of hot sauce really can’t be beat. If anything, my version is probably heavier on the vegetables than the original but then I can pretend its healthy, right? I prefer hot sauce, El Pato brand specifically, to salsa for the serving but it’s your call. Sauté garlic in olive oil over medium-high until fragrant, 1 minute. Add cream cheese, sour cream, salt, pepper, chile flakes and lemon juice and stir to combine; heat until bubbly. Add the parmesan and all but a Tablespoon or two of the mozzarella and stir until heated through and bubbly. Taste and adjust seasoning if needed. Transfer to an ovenproof bowl or gratin dish, sprinkle with the reserved mozzarella and broil until cheese is melted but not very browned, 2-3 minutes. Serve hot with tortilla chips, sour cream and hot sauce/salsa. Make ahead: the dip can be made up to 1 day ahead and kept in the refrigerator. YUM! but I have to say, tortilla chips? must be a TX thing. Up north we had either baguette slices or toasted baguette slices. Thanks for this! Yeah, for whatever reason they served this with tortilla chips, sour cream and salsa. It doesn’t make much sense, logically, but it totally works. Omg!!! I need Houston’s to come back!! That exact meal is one of my favorites!!!! Thank you for posting this. I am going to make it this holiday! !